Washington DC has approximately 132 hotels with 31,673 hotel rooms, (DC Press – 2019) ranging from economical chains to 5-star blowouts frequented by presidents and kings from the world over. The list below represents our favorites for adults traveling with school-age or older children because we know, with so many DC family attractions, you’ll be staying around for longer than you planned. For more choices, contact your travel agent or the Washington, DC Convention and Visitors Bureau (800/422-8644 or 202/789-7000). They can provide information about transportation, special events, current special/hotel promotions, and other lodging ideas. Remember that many chains, including Holiday Inn, Hampton Inn, Residence Inn, Comfort Inn and others have lesser priced accommodations in neighboring Maryland and Virginia taht are easily reached on the Metro. Washington DC is well served by the Metro and very compact for sightseeing. 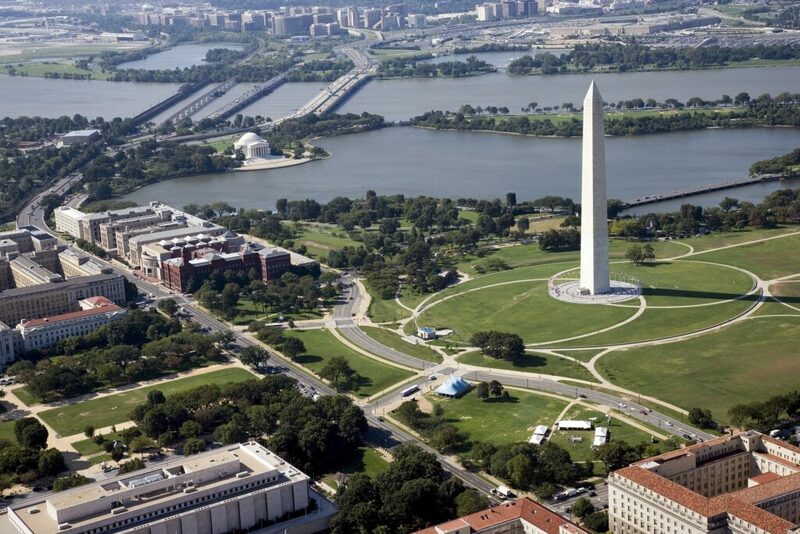 Beyond the Washington Monument in DC is the Tidal Basin, the Potomac River and beyond, the state of Virginia. Traditional in style with a homey, welcoming vibe, The Lombardy’s full-kitchen suites are well-priced for the family. It has a very convenient location just four blocks from the White House. The streets around the nearby George Washington University in Foggy Bottom are always hopping, and there are many cheap ethnic restaurants working hard to please customers. Nestled in three Victorian townhouses, just off Dupont Circle, Hotel Tabard Inn features 40 uniquely decorated rooms above one of DC’s favorite American cuisine restaurants and bars. Offering a charming and comfortable experience to families, all rates include continental breakfast and free passes to the Capitol YMCA located around the corner. Note that not all guestrooms have a private bathroom in-suite and some rooms require guests to share a washroom with another room. It’s a quirky choice but very homey and, if you avoid room #9 (by user reviews the least favorite), you’ll do fine. The two-bedded room #33 is very spacious and well set up for families with younger children too, if you don’t mind sharing the bathroom down the hall. In summer, their nice outdoor patio is a great place for breakfast. Surprisingly stylish and modern (it was designed by noted architect Morris Lapidus, and has been renovated since our last visit), this highrise hotel is on Thomas Circle, close to Union Station, and popular with business travelers on a budget. Staff is very helpful and pleasant, rooms are spacious and quiet, there’s room service and free WiFi. There’s even a self-parking underground garage. The large, ground floor outdoor pool — where you can order food — is a real plus in summer after a long day of sightseeing. 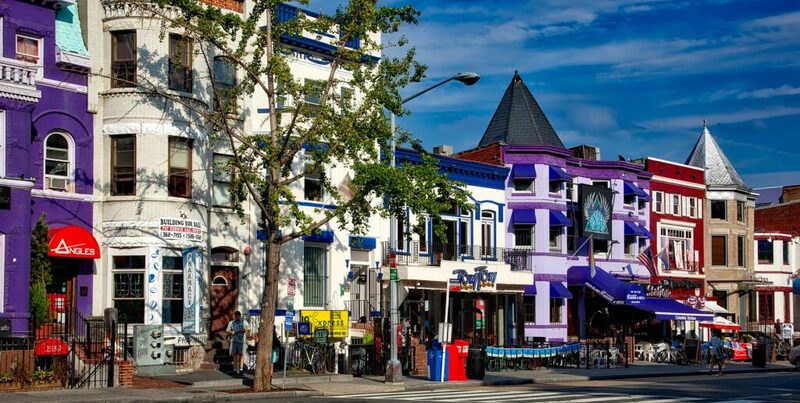 In addition to the formal government buildings, DC has many colorful neighborhoods like Cardozo, near the National Zoo. The 154 guestrooms and suites are large, comfortable and feature refrigerators and some kitchenettes; parents are sure to love this and the pay laundry room available to guests. Kids will love the life-size statue of Marilyn Monroe that greets guests as they arrive in the lobby. Conveniently located within 10 minutes walking distance to three Metro Stations, it has its own popular M Street Bar & Grill (outdoor patio too) or the Beacon Bar & Grill at the St. Gregory’s sister hotel nearby. Kids 13+ in your room pay $20 per night. This chic European-style hotel near M Street in Georgetown gives families with older kids a fun neighborhood packed with restaurants to easily explore at night. It is 10 minutes from the National Airport and near the lively Washington Harbour complex, with its riverside cafes (a big outdoor scene in summer) and bustling marina. The high style, all-suite accommodations include lots of marble, plush bedding, coffee makers, fridges, microwaves and complimentary internet access. Kids age 12+ pay $25/night to stay with you. Book ahead for the popular Rooftop Bar. Situated just outside of Washington D.C. on the National Harbor, the Gaylord National Resort & Convention Center offers a sprawling resort-like experience complete with full-service spa, on-site restaurants, and live entertainment. Seasonal offerings include a Christmas village display complete with a train ride and gingerbread making events, Cirque de Soleil show underneath the indoor atrium overlooking the harbor, and holiday ICE! display, where Peanuts characters come to life in a full-sized ice display. There’s also an ice slide where grown-ups and kids can sail down while wearing blue parkas. Regardless of the time of year, guests can enjoy an indoor pool and walk just outside to the National Harbor boardwalk to ride the Capital Wheel Ferris wheel soaring 180 feet into the air, ride with the Urban Pirates on a swashbuckling adventure, and take a sightseeing cruise. Perched on 11 manicured acres a few blocks from the National Zoo (Zoo/Woodley Park exit on the Metro Red Line), this historic hotel has hosted DC’s celebrities and political luminaries since 1930. The grandmotherly style will remind some of the Queen of England’s parlor, but the 894 spacious and comfortable rooms are well maintained, service is good, and the enormous public spaces are beautiful. Families with toddlers will love the very large (for DC) heated outdoor pool and sundeck, open April to November, and the small “Wildlife Viewing Deck” next to Rock Creek Park for bird watching. Each August, the hotel offers Dive-In movies, too, for outdoor viewing by the pool with complimentary S’mores and glow sticks by the fire pit. The Omni Shoreham is also a good place for a larger group or reunion because there are so many meeting areas. Note that kids 5 and under eat free. Located in the West End, near Georgetown and the Kennedy Center and a few blocks from Rock Creek Park, this pet-friendly hotel is a 5-minutes’ walk from the Foggy Bottom Metro station. The 415 quiet and spacious accommodations boast a luxe New World style, and corner rooms have a large sofabed that easily accommodates kids. Room amenities include fine toiletries, a coffeemaker and tea setup, bathrobes and slippers, desk and small dining area, all lending the place a home-away-from-home quality. In addition to the service you’d expect, the Fairmont has a great fitness room open 24/7, a Balance CrossFit Center with state-of-the-art equipment, a sauna, steam room, regularly scheduled classes — and even a Paleo Diet meal option at their snack counter. Bet yet with little ones, the large, heated indoor pool keeps regular “Family Swim” hours and the full service locker rooms make it easy to clean the kids up afterwards. Fairmont’s lavish weekend buffets at Juniper, its farm-to-table, sustainable cuisine restaurant, are worth booking ahead, even if you’re not a guest. Check out the clever, healthful kids menus that reflect the hotel’s partnership with the Smithsonian Museums (Dinosaur Egg Omelet with “Triceratop’s favorite meal: sliced fruit”) and the beautiful interior courtyard where meals are served — a peaceful urban getaway for parents and a place to let off steam for kids. Despite its inconvenient location outside the city, and the availability of a Ritz-Carlton right in town, we think families traveling with toddlers will be interested in this posh hotel’s “POLO (Protect Our Little Ones) Program” which provides room baby-proofing free of charge. Note that small pets are welcome. It’s an especially fun destination around any major holiday as they plan lots of special activities for kids and really do up the themed decor. There is a Day Spa on premises, and babysitting available so you can take advantage of it. Just a minute’s walk from the White House, this huge, 772-room bustling center of international diplomacy features two restaurants, an on-site Starbucks, an indoor pool, exercise and game room, and staff babysitting. According to families who have stayed at this large, deluxe property and enjoyed its excellent service, the steep weekend rate is worth it. Invest a little more for a room with a great city view and, if you can’t afford it, don’t worry. Washington DC is full of great Marriott brands; the new 1,175-room Marriott Marquis Washington, DC has weekend bargains near the Convention Center, and the many Courtyard by Marriott and Fairfield Inn properties ensure you’ll find a place within your budget range. Your mind may jump straight to Airbnb, yet this long-standing B&B booking agency represents dozens of properties including furnished apartments. The agency will interview you regarding your budget and desired location and then make suggestions that meet your needs. If you’re going this route, ask what’s available on the pretty historic streets of the Capitol Hill district.